A new format, 6+, the latest instalment in PokerStars’ series of new cash game variants, rolled out yesterday, January 16. The short deck hold’em format sees all numbered cards lower than a six removed from the deck and a new blind structure introduced, the “Button Blind”. Instead of small and big blinds, all players post an ante and only the player on the button posts a blind. Available in a six-handed format, the narrower card range combined with an action-oriented blind and ante structure brings a shift in strategy that players will need to adapt to in order to play successfully. A flush now also beats a full house. Given that there are only nine ranks of cards, players will flop a set 17% of the time, making a full house much more achievable. Flushes, however, will be more difficult to come by as there are only nine cards in each suit. PokerStars School provides further strategic overview for 6+ including hand rankings, pre-and post-flop approaches for members. Non-members can sign up for a PokerStars School account for free and access a wealth of strategic knowledge. Over the next couple of weeks, players should also watch out for PokerStars Ambassadors on Twitch hosting special multi-camera streams which showcase 6+ games. 6+ will be available to play 6-max at all stakes for real and play money on desktop and mobile. The game will be rolled out on .DK, .EE, and .NET on January 15, followed by .COM, .EU, .UK and .ES on January 16. 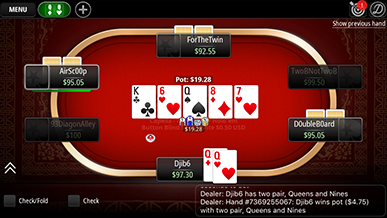 Players will find the games under the dedicated 6+ tab in the PokerStars lobby.